Using the latest technology and hours of work, a multi-disciplinary ensemble of researchers has recently “brought back to life” the face of an Egyptian mummy. The woman, who they have named Meritamun, is believed to have died between the ages of 18 and 25, at least 2,000 years ago in ancient Egypt. Her remains were only brought to attention after her mummified head was discovered in the somewhat undignified resting place of the dusty basement of the University of Melbourne’s medical building. It’s believed the head made its way to Australia through Professor Frederic Wood Jones, an anatomy expert at the university who was part of archaeological work in Egypt during the 1930s. The story of this young woman is almost a total mystery. However, through this reconstruction, they’ve managed to piece together some of her life. 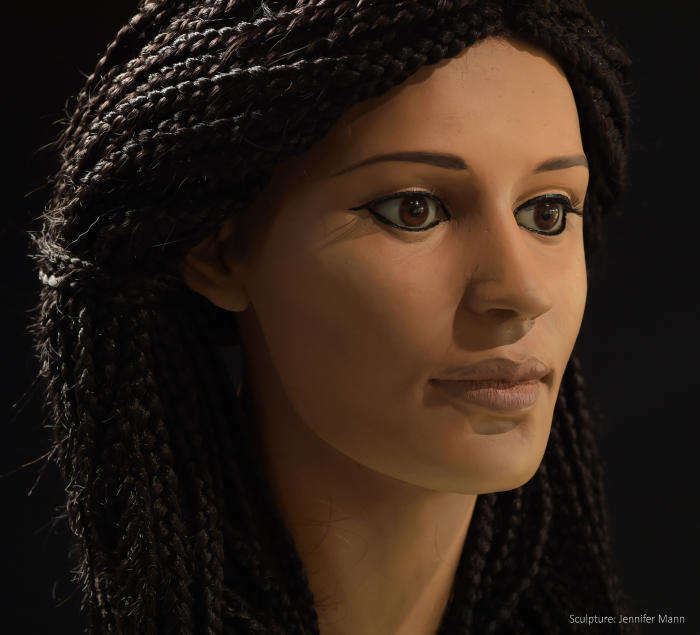 “By reconstructing her we are giving back some of her identity, and in return she has given this group of diverse researchers a wonderful opportunity to investigate and push the boundaries of knowledge and technology as far as we can go,” Dr Janet Davey, a forensic Egyptologist from Monash University in Australia, said in a statement. The project started by conducting CT scans on the still-bandaged skull. This work revealed the skull was in surprisingly good condition. It also revealed that the woman was suffering from two deep tooth abscesses and a thinning, pitted skull. This is a sure sign she had anemia, as the bone marrow swells in a bid to make more red blood cells, which then thins the bone. Since she was from Egypt, the researchers believe this could have been caused by malaria or the flatworm infection schistosomiasis. Biomedical scientists from the University of Melbourne are now in the process of analyzing the mummy’s tissue in order to compare the types of isotypes found in her body. This could give an indication of her diet and even the region she lived in. The next step involved reconstructing a model of the skull using data from the CT scan. The skull took 140 hours to 3D print and some further tweaking by medical imaging technicians. The skull was then handed to sculptor Jennifer Mann, who has a background in forensic reconstructions. Using data based on modern Egyptians, the researchers pieced the tissue depths at certain points of the face to give an indication of her face shape. For example, it was known she had a mild overbite and the dimensions of the nasal cavity could be used to give a definitive size and shape to her nose. The head was then cast in a polyurethane resin and painted. Researchers still argue what skin tone was dominant among ancient Egyptians, but they settled on an olive tone as a kind of “middle course” of the debate. Her hair was modeled on Lady Rai, an Egyptian woman from around 1550 BCE, whose mummified remains clearly show a braided style of hair. You can watch a time-lapse video of forensic sculptor Jennifer Mann reconstructing the face of Meritamun below.